Whaoo...what an honour to be the first here and creating a new topic! 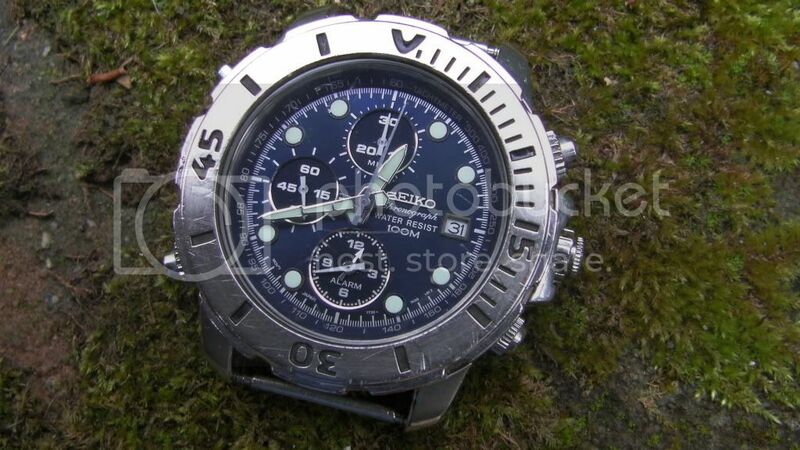 Don't order a Seiko p/n 320P03HNO3 for your 7T32-7F80 - order a Sternkreuz p/n MSM320 instead .... of more anon. PS - Well done for starting the thread, Arpad ! O.K.. I'll fess up to having had a couple of 7T32s pass through my hands, and still owning a couple which I bought deliberately. 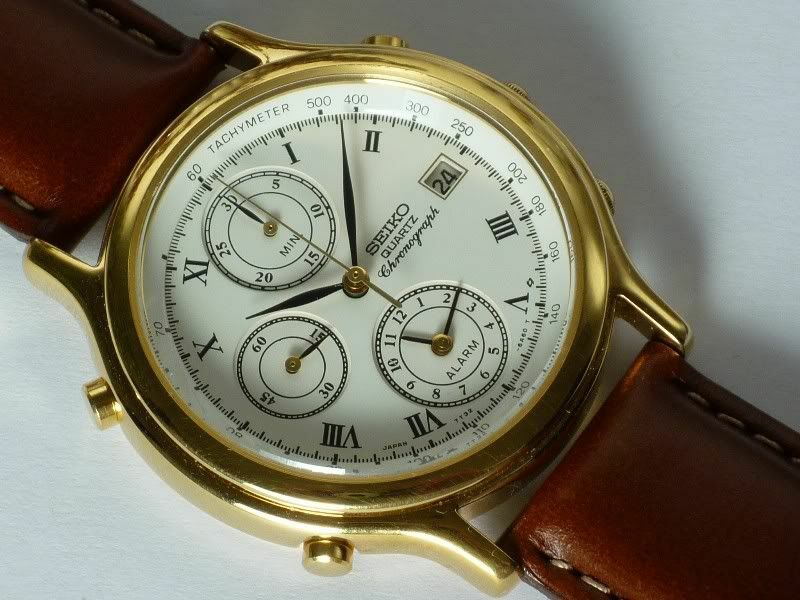 This was only the third 7A38 I'd bought on eBay, and as the Italian seller described both watches as being in need of new batteries - and knowing what I've since learned about the damage old run-down leaking batteries can do to the insides of a watch, also something of a gamble. 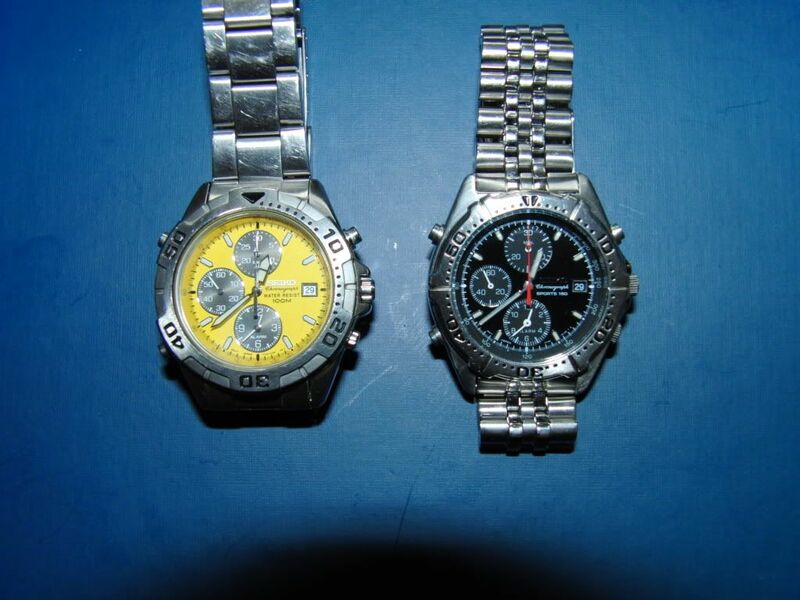 I wasn't even changing my own batteries in those early days of my watch collecting, so I took both to my trusted local jeweller / watchmaker. The 7A38-7270 was squeaky clean inside and fired up straight way, but the dead battery in the 7T32 hadn't fared so well - it had had leaked, and attacked the contacts, and maybe worse. 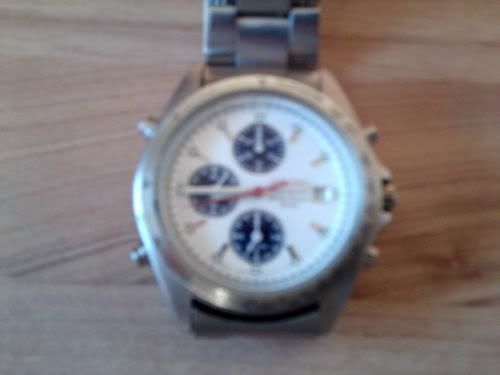 I put it back on eBay almost straight away - the same weekend, (re)using the last two of the previous seller's photos (above). Listed as 'For Spares or Repairs', I got $25 for it - peanuts really, but then I'd only paid 49 Euros for the two of them. 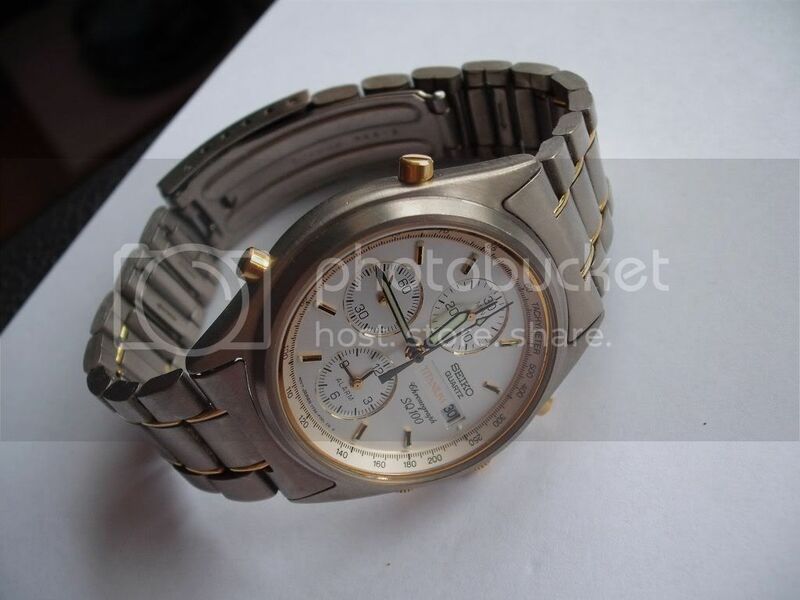 The other 'pass though' also came as part of a job lot, which I bought for the NOS 7A38-7250 (with SAA080J tags), and a lightly used gold-tone 7A38-7289, on eBay in October 2009. 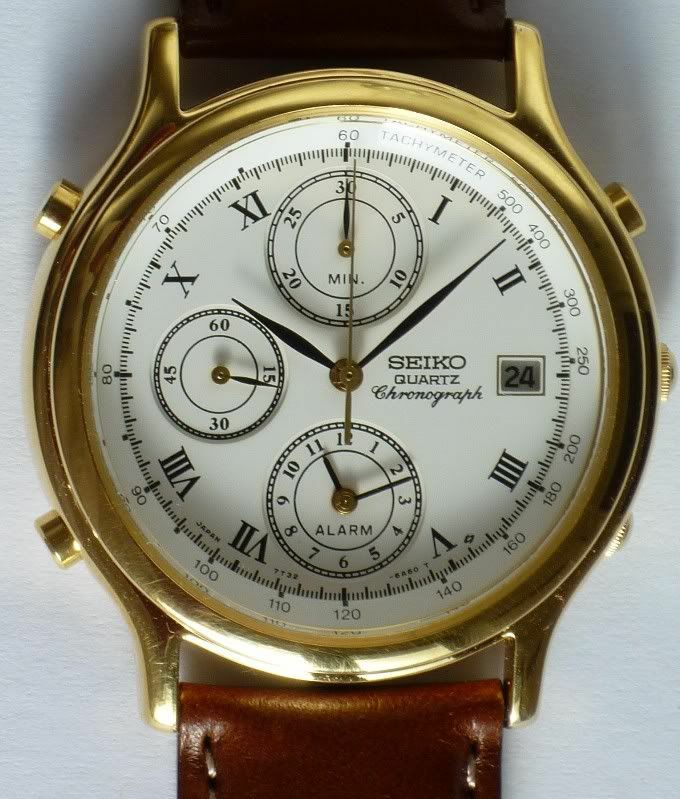 It was a similarly dressy-looking gold-tone 7T32-6A60. Now if this had been a 7A38, I would have kept it, but it didn't do anything for me. So it was always going to be re-sold .... eventually. 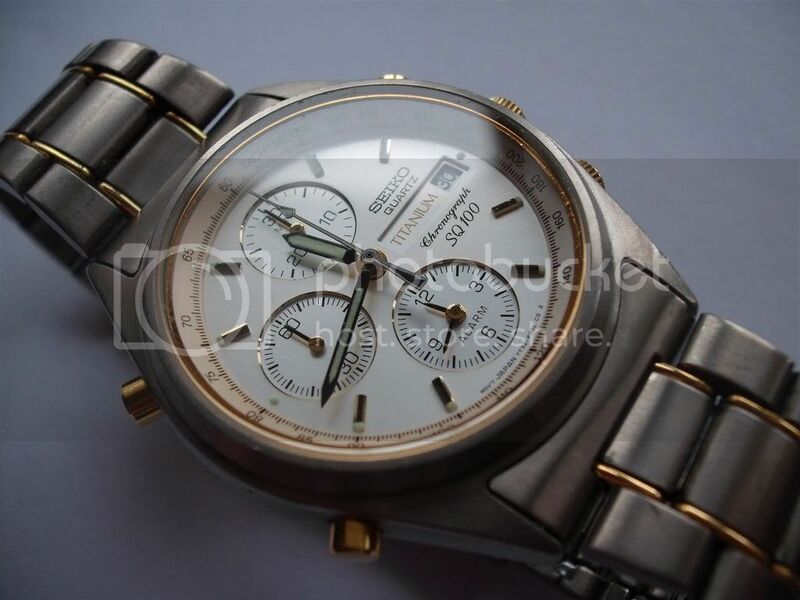 This is a good example of how not very good I am, at selling watches that I have always intended to put back on eBay. 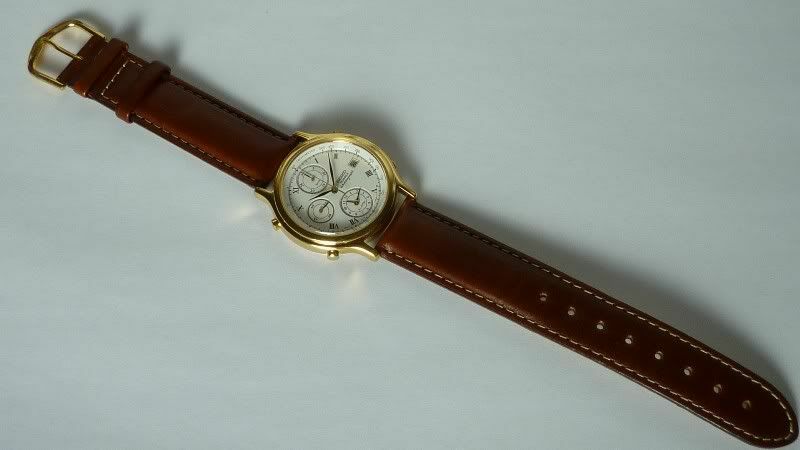 Well worth the effort (eventually), because on this occasion I got £79.50 for it - a darned good price for a dressy 7T32 ! 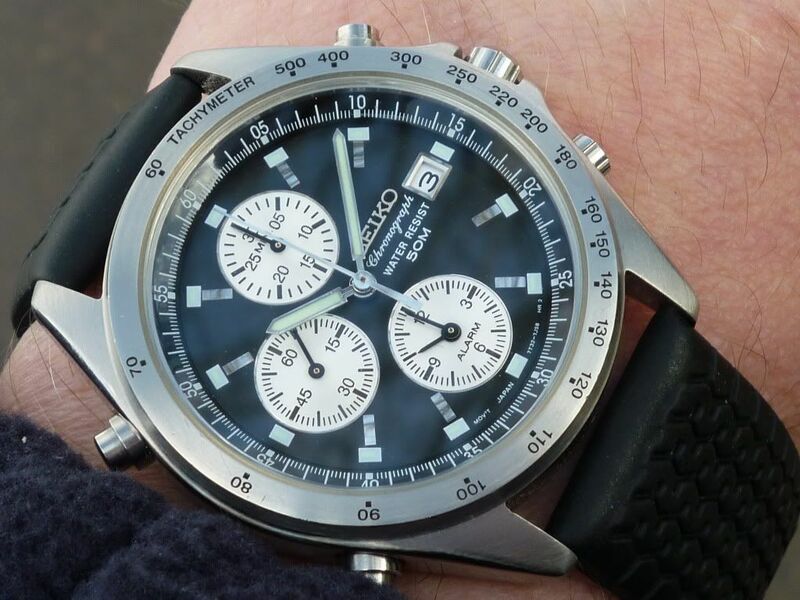 I happened to notice a chap at work wearing a rather attractive all-stainless Seiko chrono' with a White and Navy 'Panda' dial. 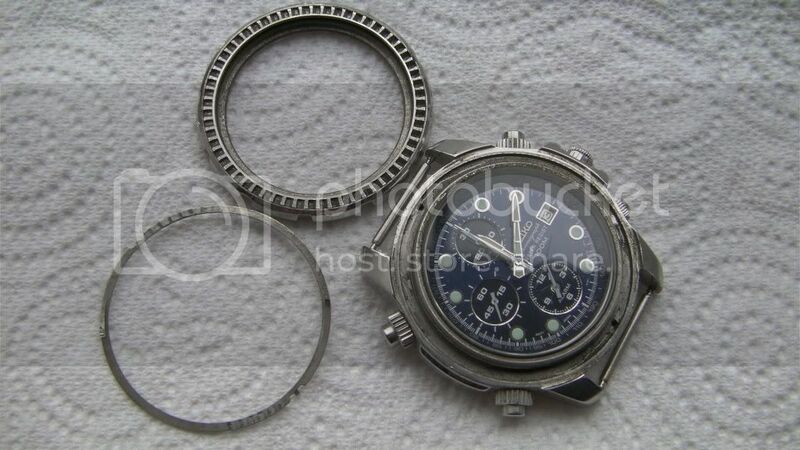 I immediately recognised the 3-pusher / 2 crown configuration as a 7T32, and asked him if he'd mind showing me the case-back. 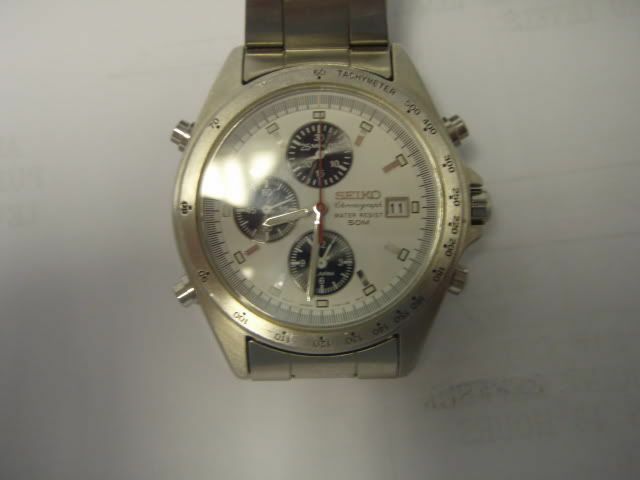 I made a mental note of the case number - 7T32-7F80 - indeed the very same watch which Simon appears to be rebuilding. 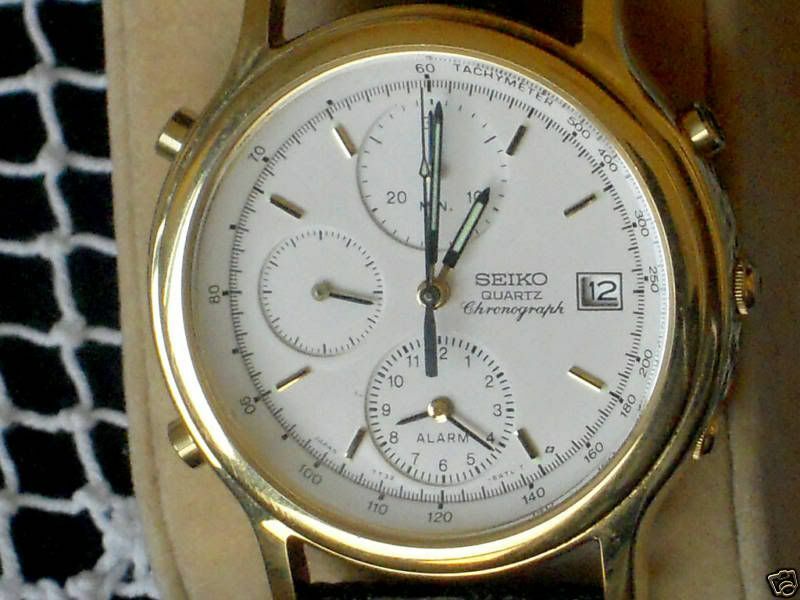 When I got home, I set up a saved favourite search on eBay on 'Seiko 7T32-7F80'. 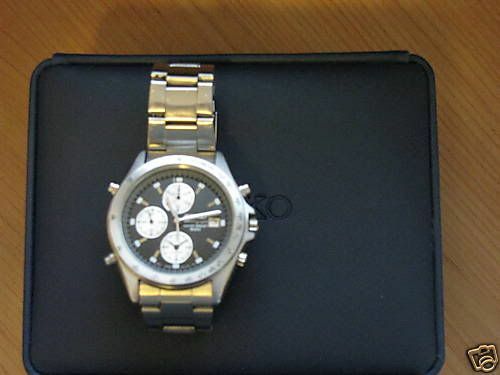 Within a week I received an eBay notification. 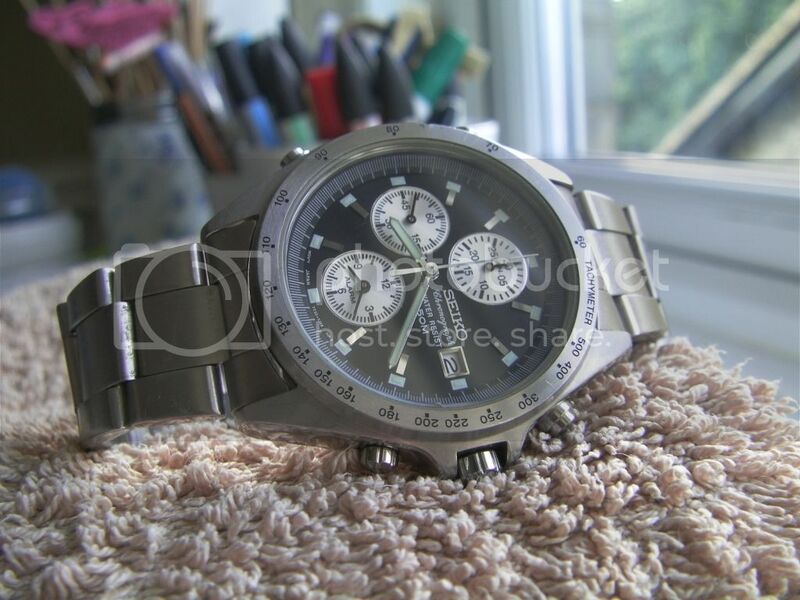 I messaged the seller, asking if he could email me a couple of better larger photos of the watch. These are what he sent me. Still not exactly brilliant, but as it came with the original box and manuals and spare links - I bought it. 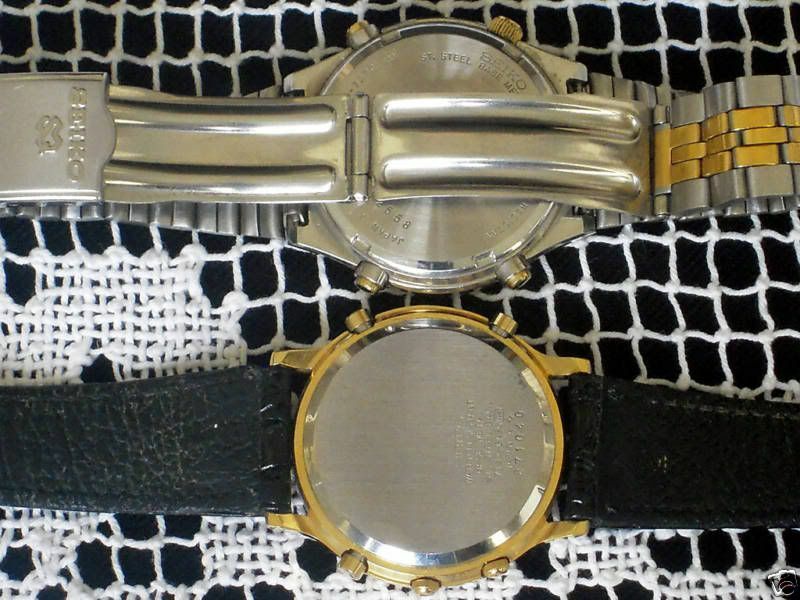 I wore it for quite a while, as received but cleaned, and later refurbished (and also modded it slightly) - of more anon. 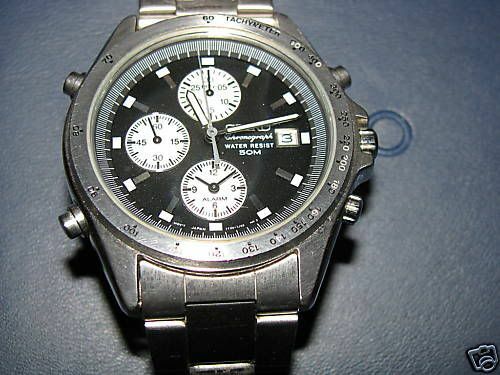 and in August 2009, I received another notification from eBay, adivsing that another auction for a 7T32-7F80 had been listed. 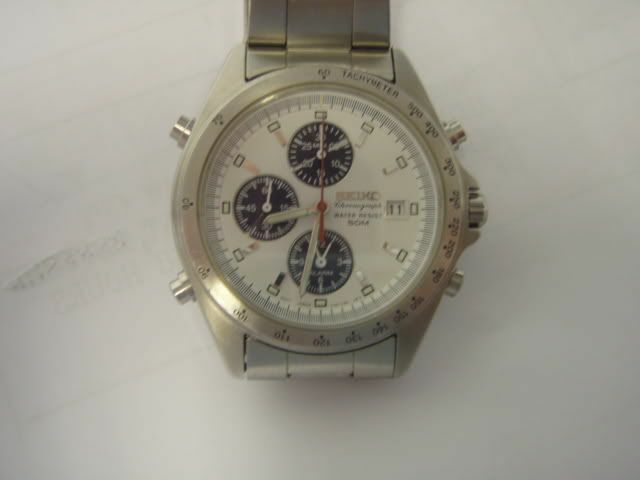 As you can see from the seller's second photo, it had lost some of the painted inlay numbers from the Tachymeter bezel scale. 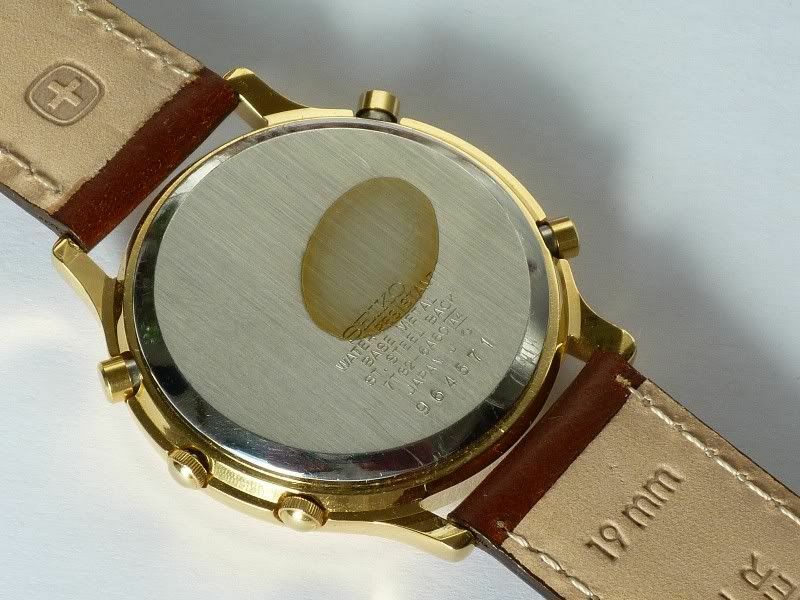 Incidentally on this particular 7T32, the bezel is not separate and removeable, but an integral machined part of the watch case. 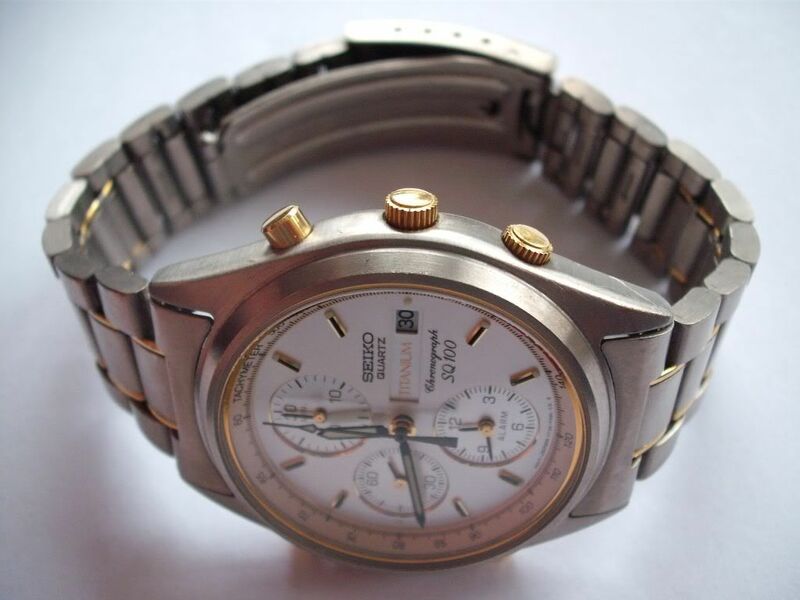 I later bought another of the same version (by default), which came with a stainless white-faced 7A38-7190 in the same eBay lot. 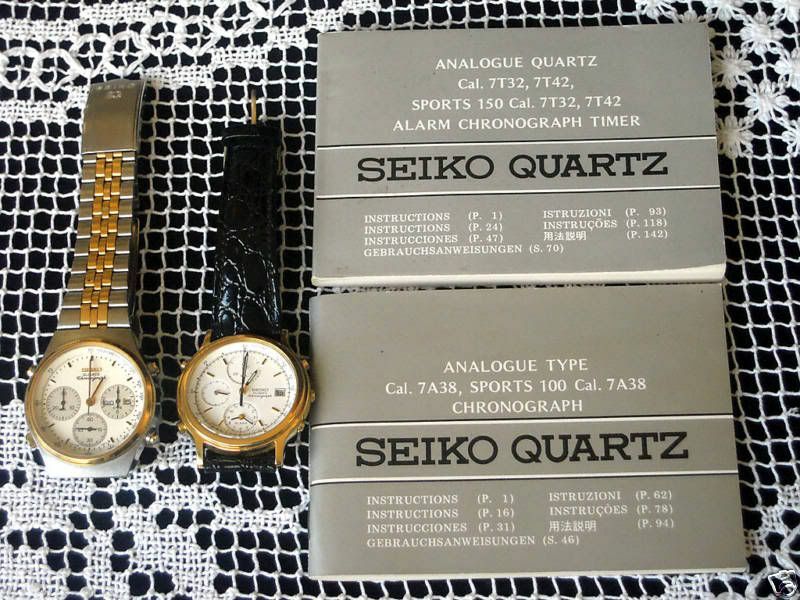 In the meantime, I discovered that wonderful resource - Seiko Oceania's database - and that there were 3 versions of 7T32-7F80. 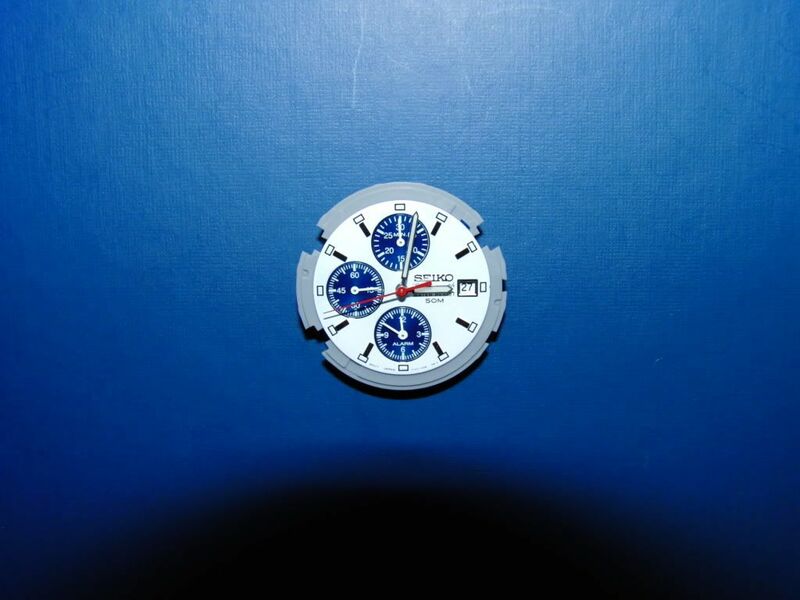 Having seen that image, and not been able to find one since, I became a little dissatisfied with my white / navy blue SDWE01P1. 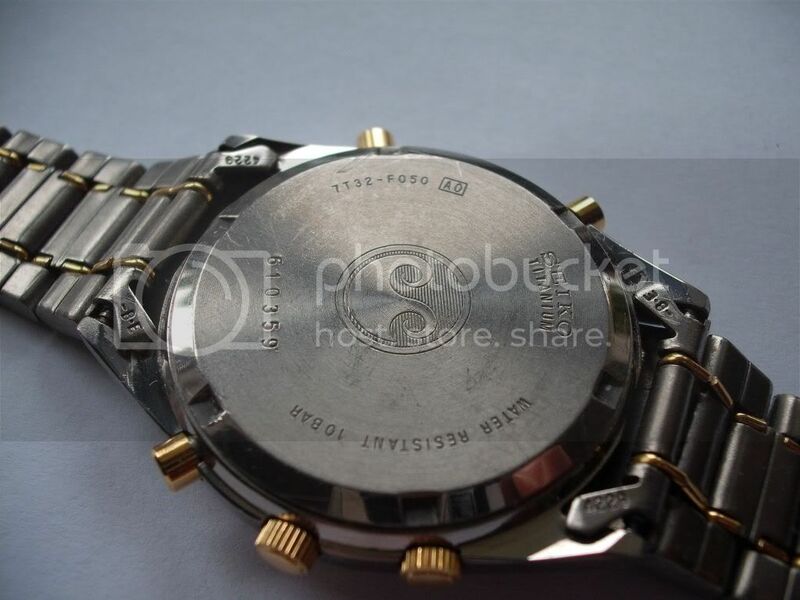 and I wanted a navy blue minute ring to match the subdials - the equivalent part used on SDWE01P3 and SDWE01P3 is black. 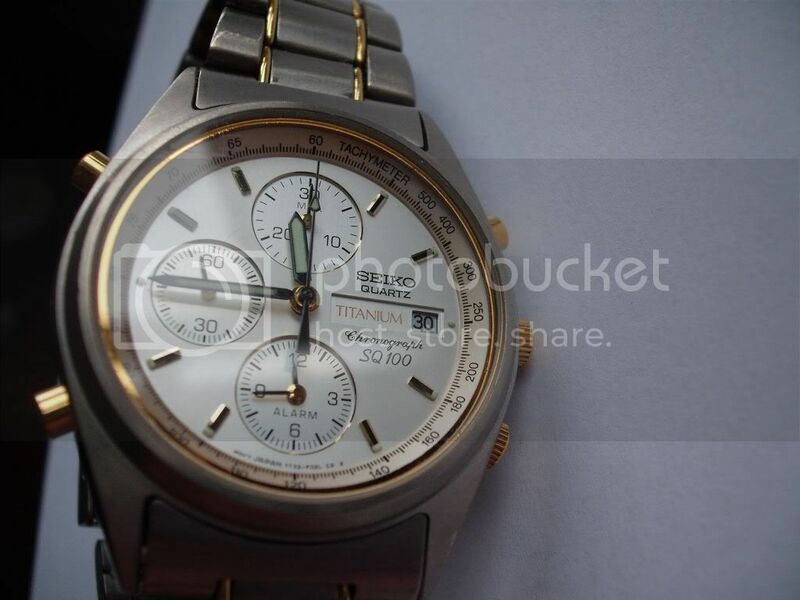 This is the same watch as in those eBay listing photos from August 2009. 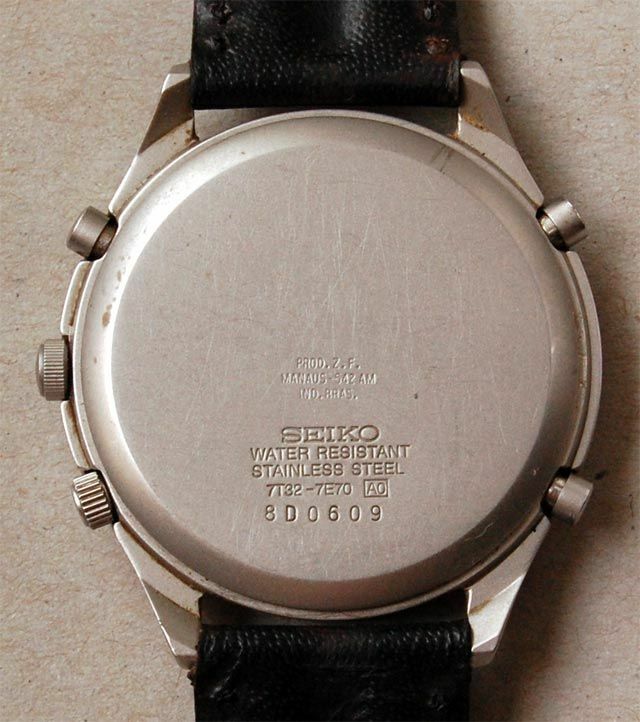 The case has been re-finished; bezel lettering painstakingly re-painted (with a 000 paintbrush); original scratched crystal replaced with a Sternkreuz p/n MSM320, and fitted on a 20mm 'Rubber Tyre Tread' strap, rather than the original bracelet - and, of course, with the 7T62 minute ring. Looks a bit better now, doesn't it ? I was just going back through my eBay watching list, clearing off some ended auctions - I'd reached the maximum 200 again. Guess what I came across ?? Didn't realize till I looked at the bidding history it was the one you won. Similar, but not as good as the (extra) photos I had to go on. Here's one I picked up 'off' the bay recently - a 7T32-6H60. It's one of the Macchina Sportiva by Giugiaro, with a saphire crystal and a real weight to it. I'm on the look out for a couple more links, so for now it's just for show. 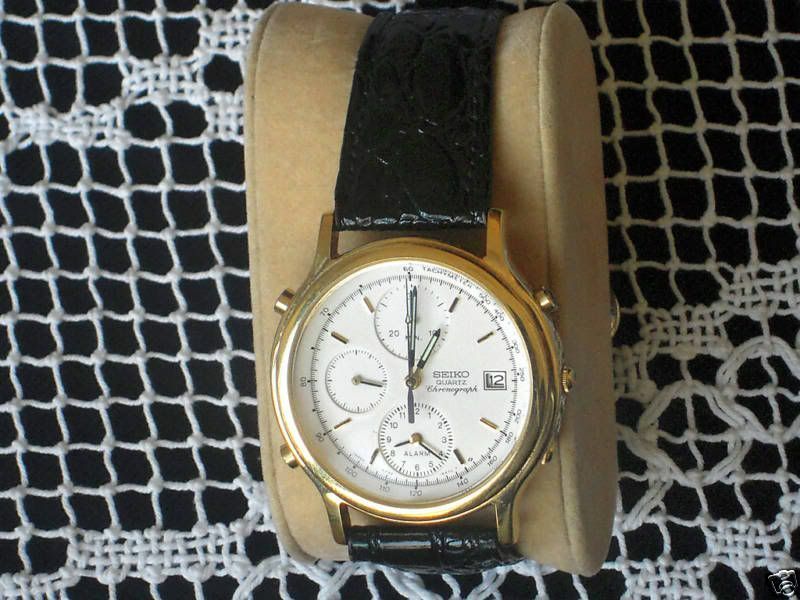 I don't have a decent photo to upload of my white / navy 7T32-7F80, and I need to clean it up first. I might get around to cleaning up my other lightly modded White / Navy 7T32-7F80 soon, and maybe post some photos next weekend. 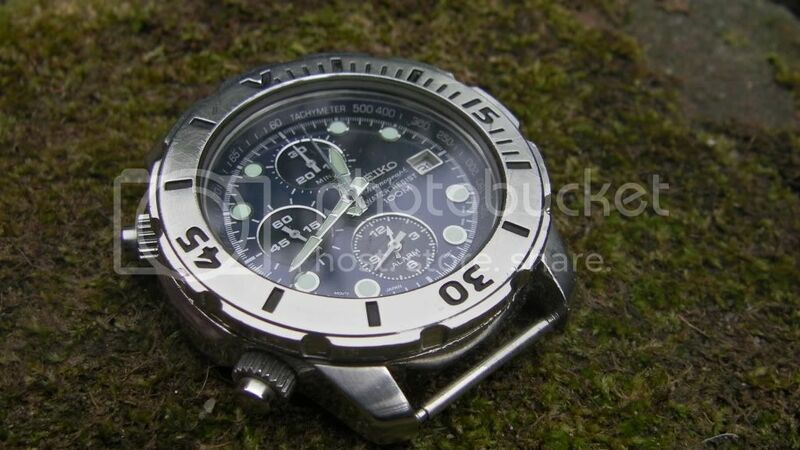 Does anyone know how to remove the rotating bezel from a 7T32-7H10? 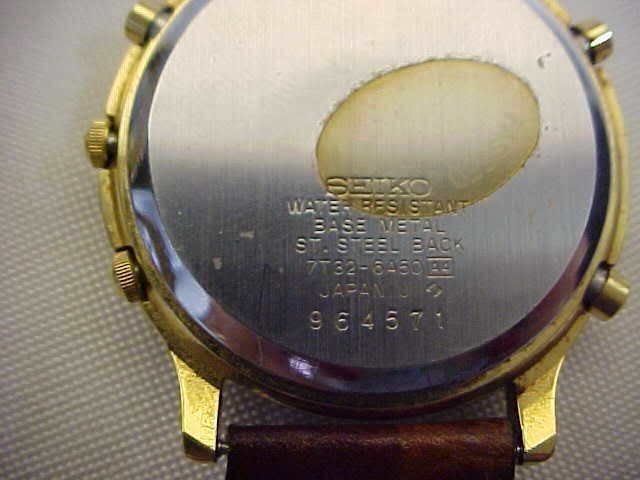 It seems the previous owner tried to pry the bezel up...there are couple of marks on the case. I don't want to damage the case more so I'm wondering what is the right method to remove it. Any idea? 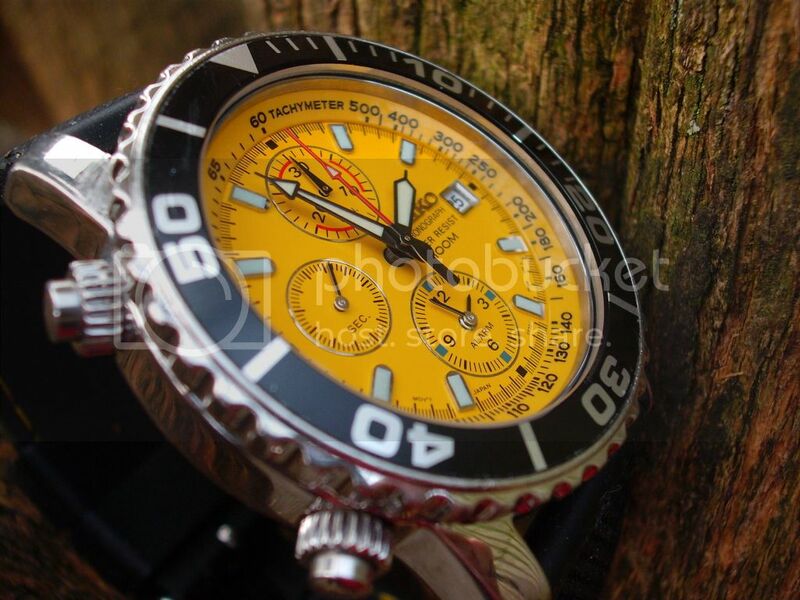 I want to replace the crystal but I'm afraid I have to remove the bezel first. So, to answer your question (finally!! ), just pry the bezel off (with a suitable tool / knife) - I masked the case arms with tape (as suggested by Paul) to protect them. I have finished this one as well. 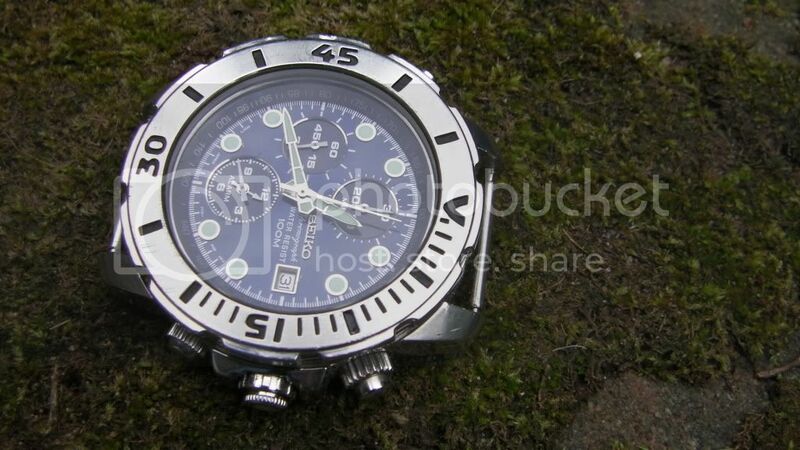 I removed the rotating bezel, there was a massive amount of dirt underneath it. 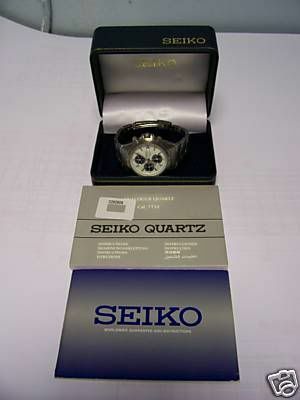 The original crystal was around 2.85mm thick. I used a 3mm aftermarket Cousins. 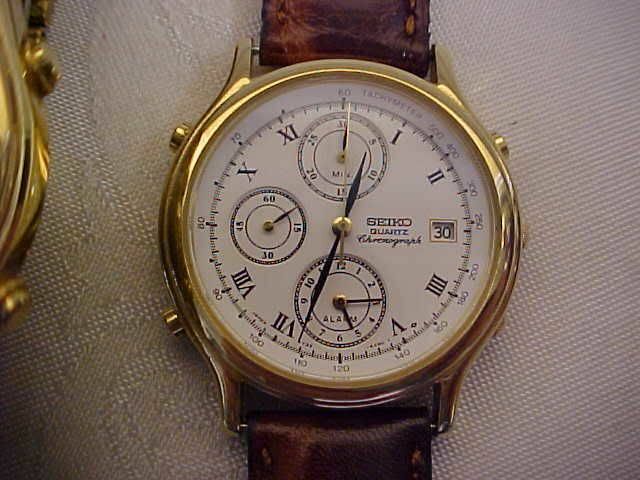 Luckily I could press it deep enough to give sufficent space for the rotating bezel. It went back smoothly and rotates freely. Thank you Simon for the encouragement! 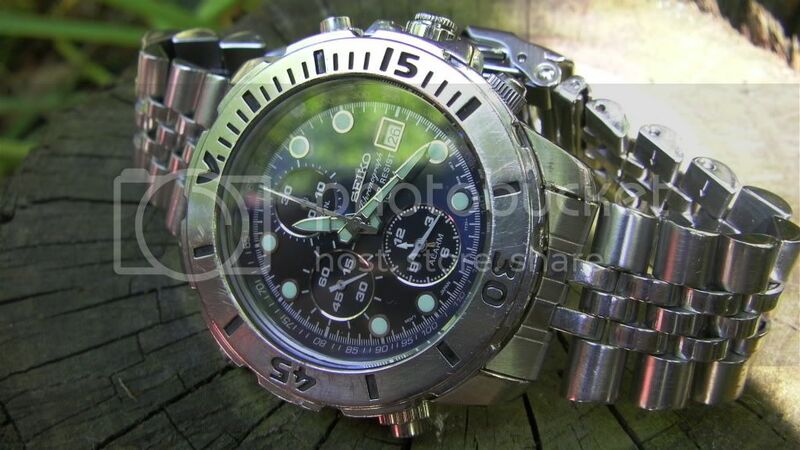 Needs a new crystal, a new case back gasket and a good clean. 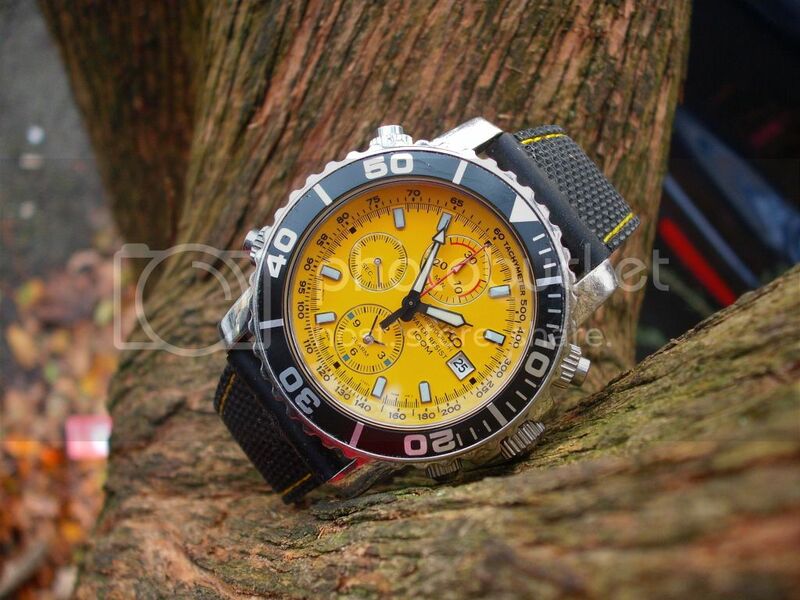 This is probably my favourite 7T32 - I have two of them (the lightly modded one on the 'Rubber Tyre' strap posted above somewhere). 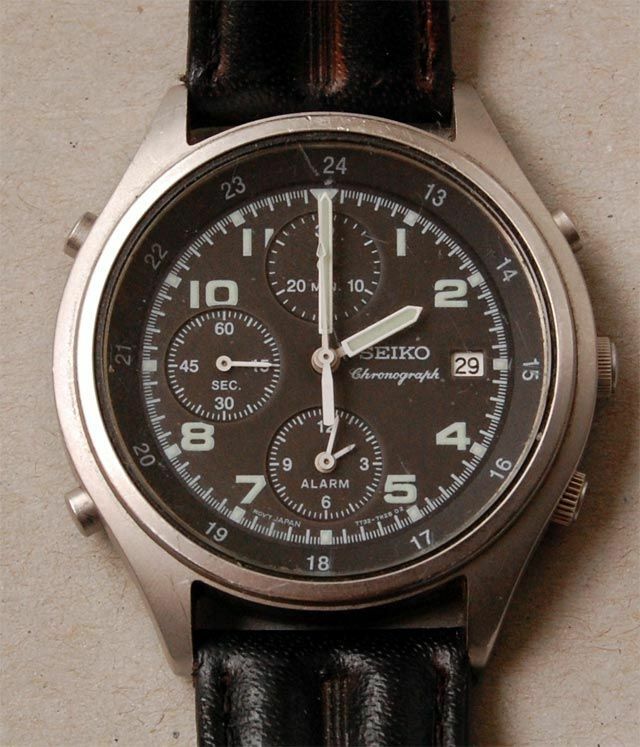 I know you don't like paying genuine Seiko spare part prices, so may I recommend a Sternkreuz MSM320 for the replacement crystal and Cousins p/n 33503550C for the case-back gasket. Some very nice 7Txx; especially the 7T32-7F80 looks great! Are 7T42 allowed here? 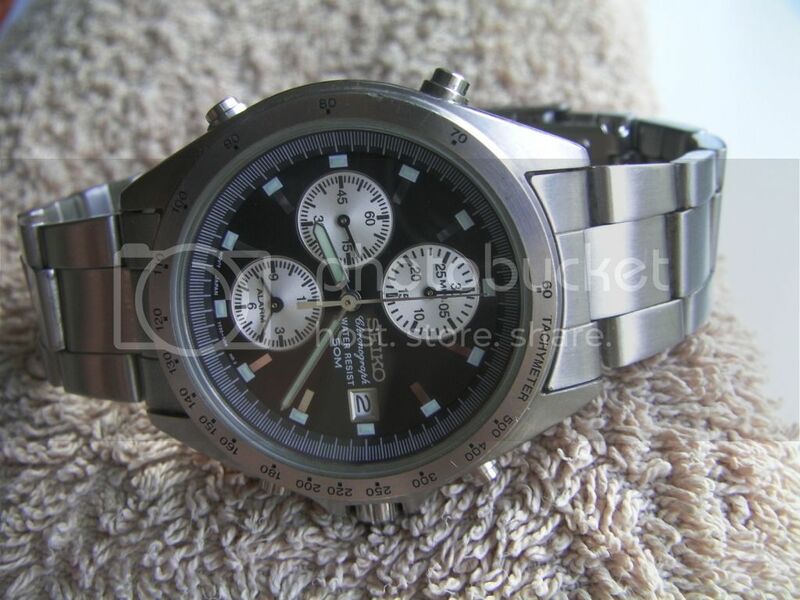 Here´s a 7T42-7A10 Titanium which, of course, looks a lot like a 7A38-7030. 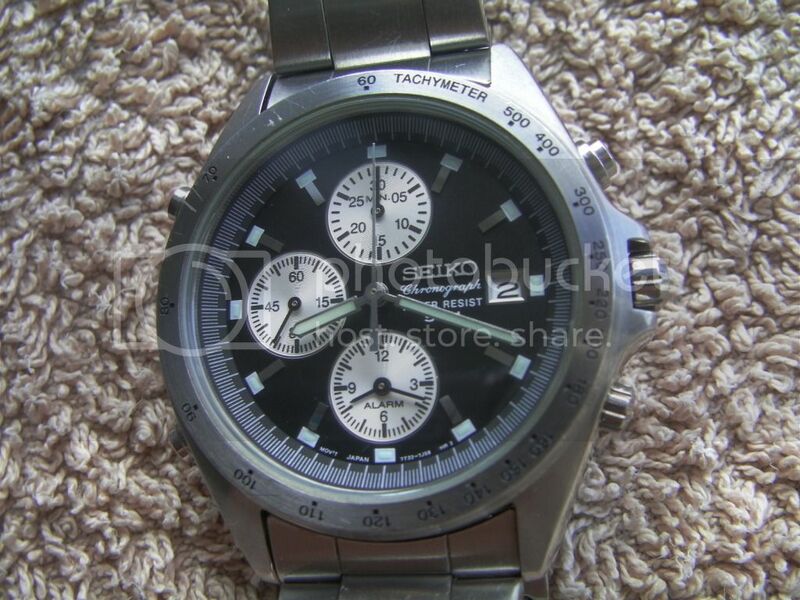 I like Achim's 7T42-7A10 a lot! 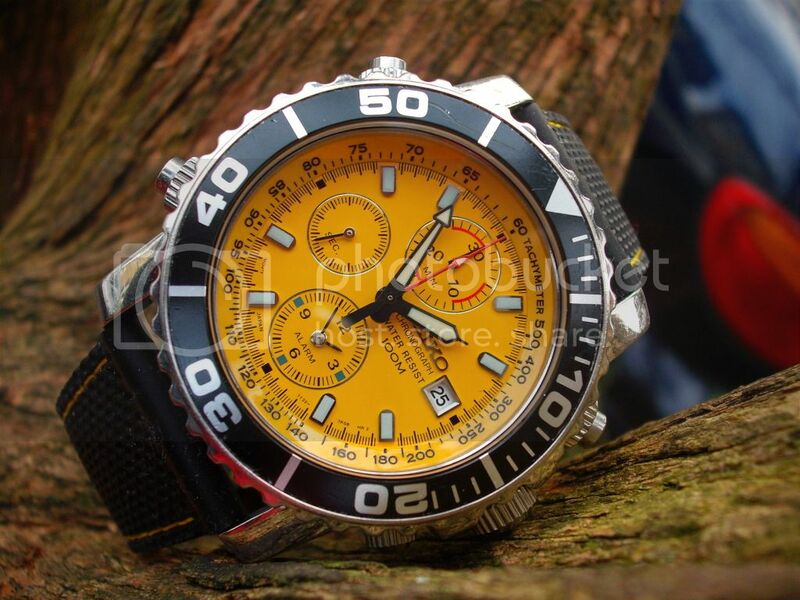 Very nice looking watch, I like the Timer function too. But now, I would like to add couple of photos about my 7T32-7G30. It's not in the best condition I have ever seen but not too bad. I have replaced the glass using the Cousins F300CMH320 crystal. Moreover after Paul's suggestion I purchased the Cousins 33503550C case back gasket which is a perfect replacement. 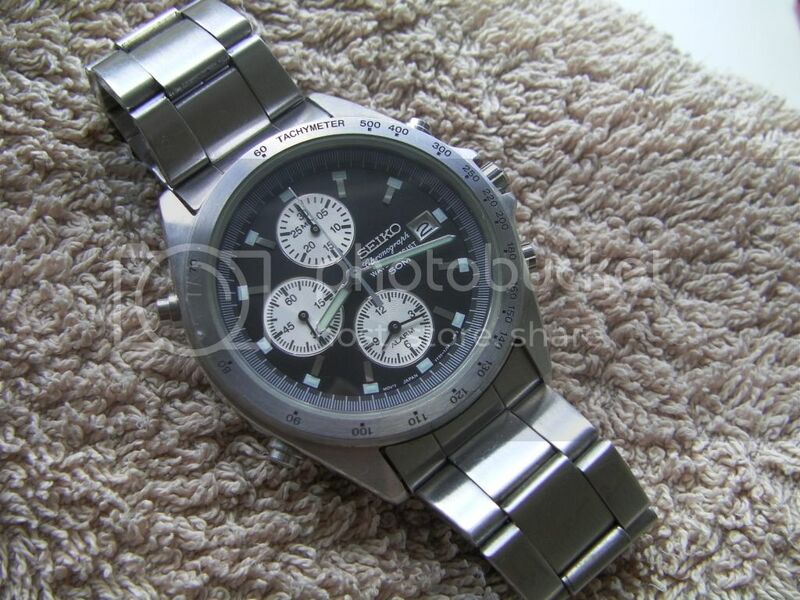 I don't have the original stainless steel bracelet which I don't really mind as I wanted to replace it anyway. 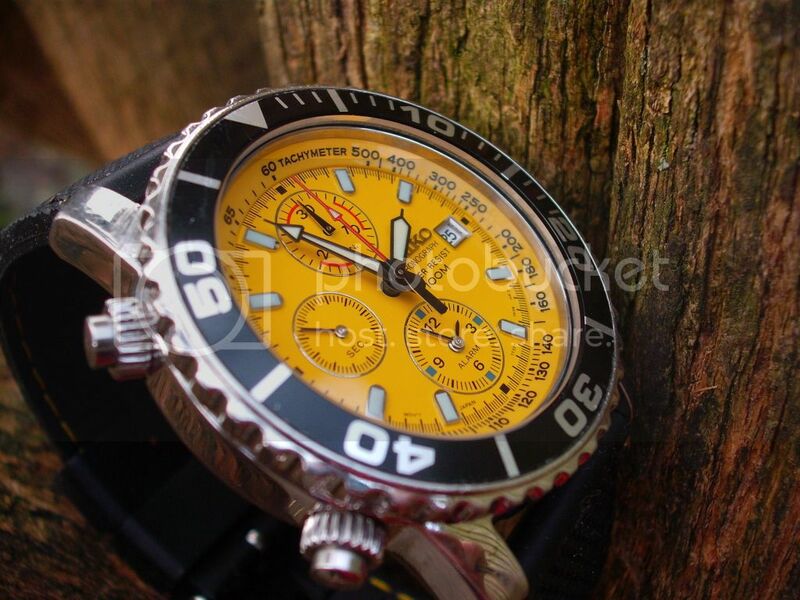 Apparently a genuine Seiko Z22 is on the way from USA but until then I have put a cheaper yellow stitched rubber band. 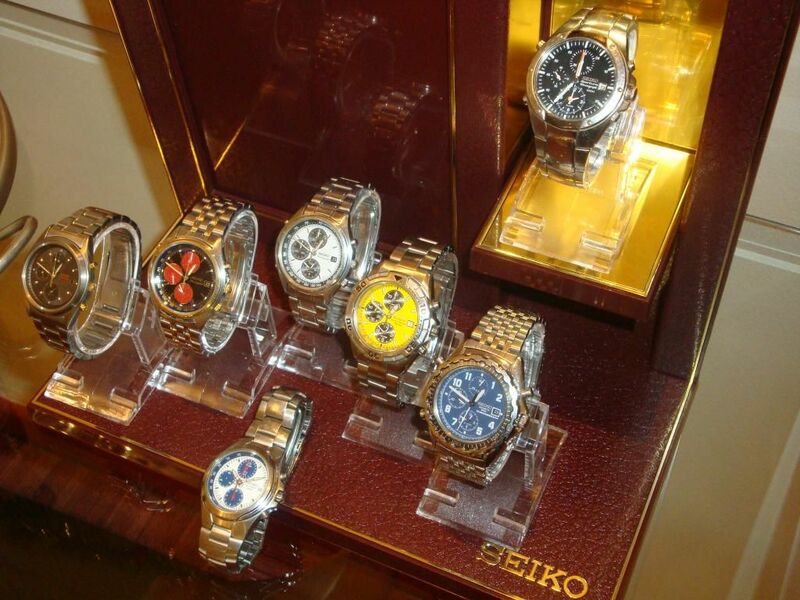 I still have a few - offloaded some to pay a couple of bills and now back on a buying spree! 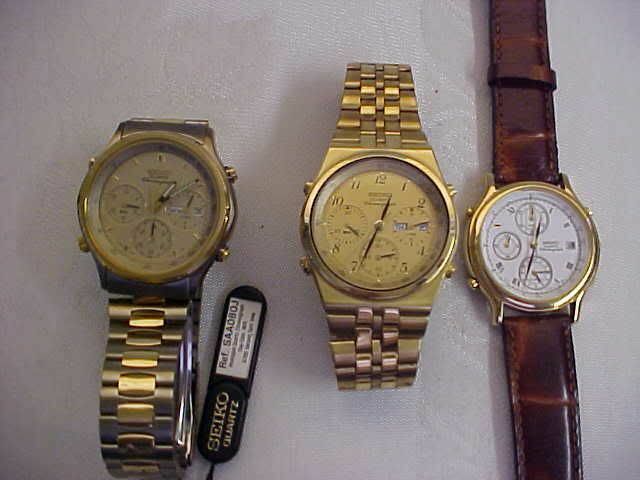 Four more in this little group shot, although the two on the left (ti model and gold plated cream dial) were both just bought as spares watches and have left the nest. And this snap is a couple of years old. 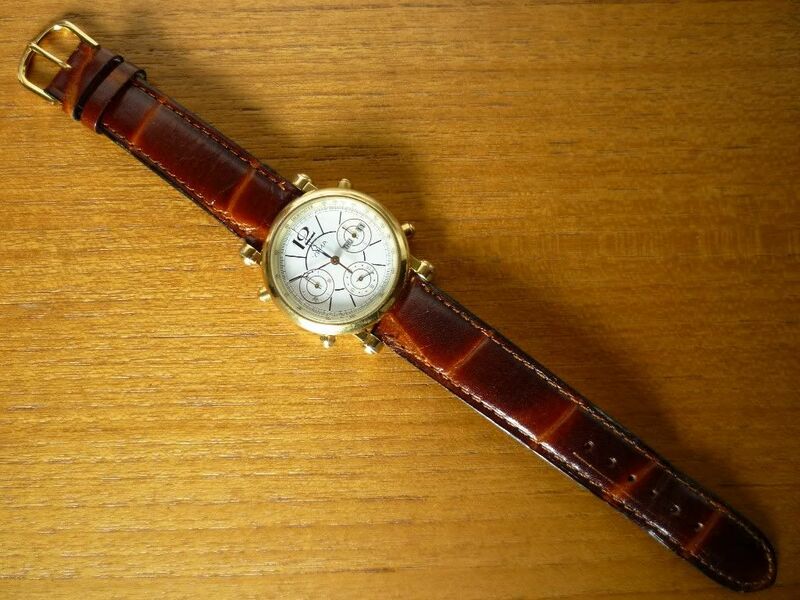 My beloved Giugiaro on original sharkskin strap. Found in a jewellers as NOS and kept in mint condition before I sold it in the run up to my wedding. 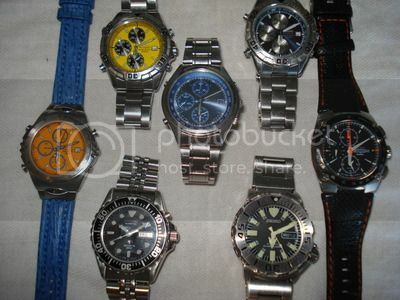 A couple of beaters too, the light blue dial was a good work watch, and the dark blue with silver subs is a favourite. 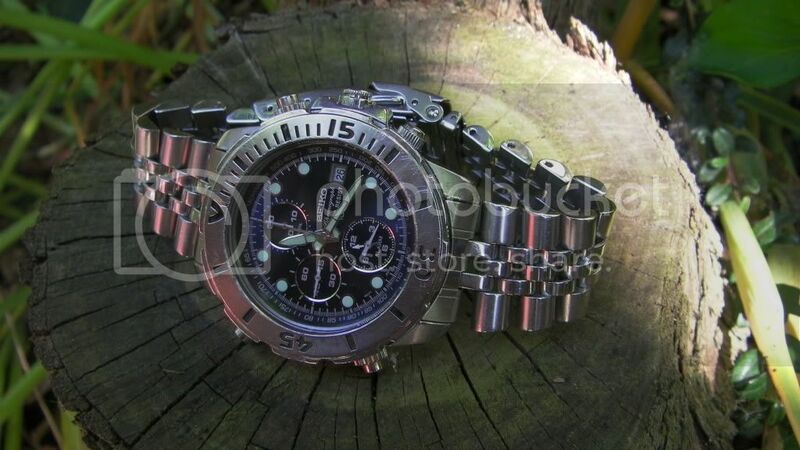 I was pretty pleased with this bead blasted full lume SQ100 as well but it gave up the ghost so another e.bay donor watch! 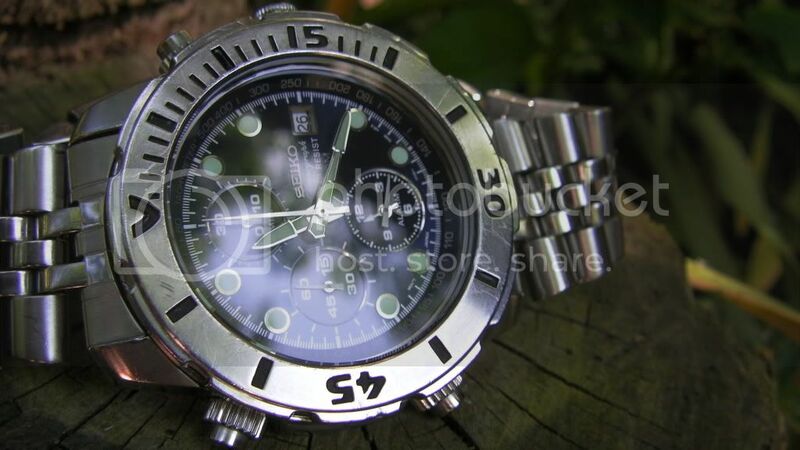 One I'm looking to replace in the near future. 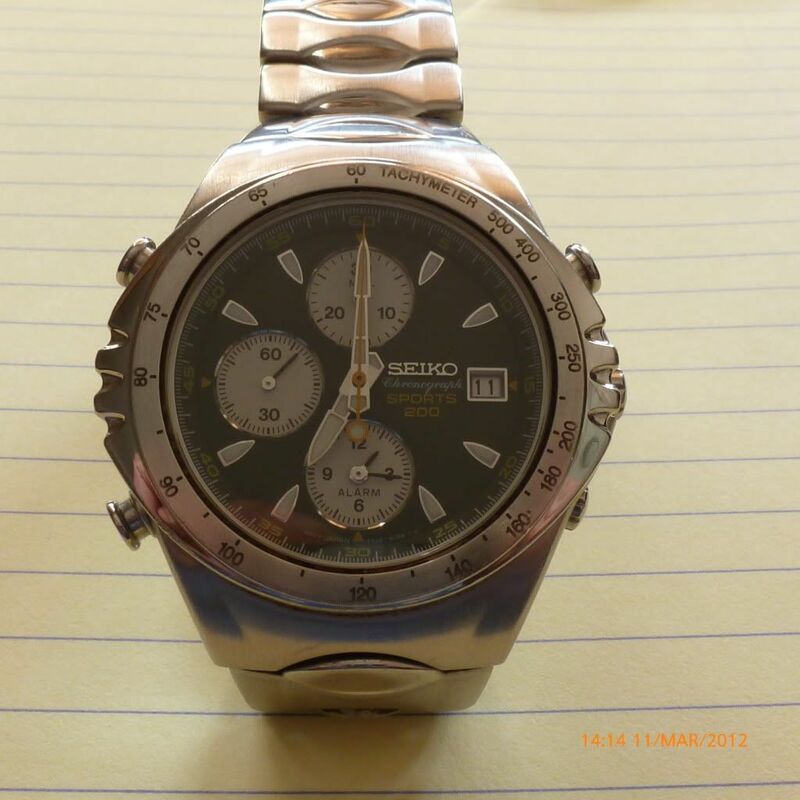 I love my Seiko 7T32-7E70 that is below, this watch saved my left wrist and hand from a car accident, I was hit by a car in last March. I will never send it to fix. 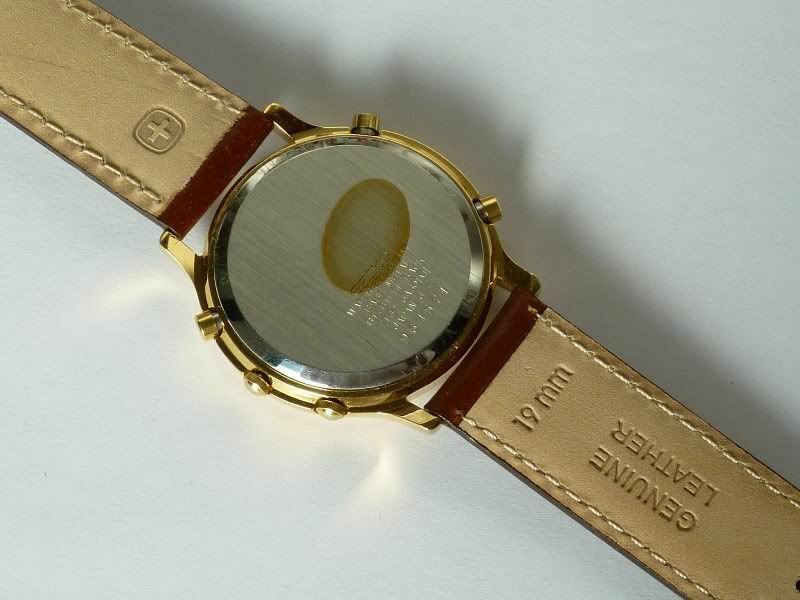 I remember it well, Paulo, or at least as it looked before your unfortunate accident - complete with ZFM stampings on the case-back. 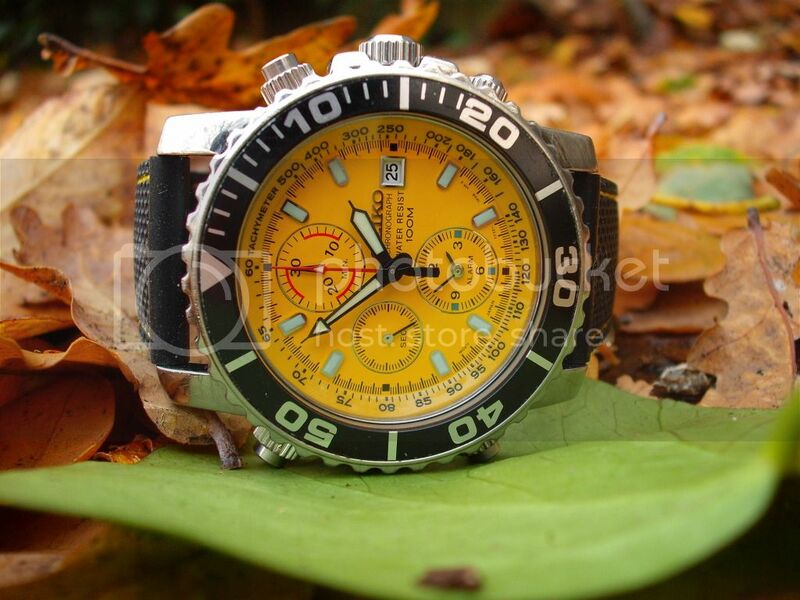 Glad to hear you survived relatively unscathed, even if the watch didn't.